This is the third in a series of posts breaking down the Eagles position by position in advance of the upcoming draft and (hopefully) free agency. We’ve already looked at quarterback and running back. Today we’ll examine the wide receivers. 2010 Recap: I already explored wide receiver performance in a previous post — so go check that out. Jeremy Maclin led all receivers in targets and DeSean Jackson had the highest yards per target, with Jason Avant retaining his premier slot position role. Because the top three guys are so talented, there was little left in the pie for the large rookie Riley Cooper or tiny Chad Hall. The duo combined for only 17 receptions the whole season. Who’s Leaving: No one has to leave. They’re all under contract for next season, although Hall’s roster spot certainly isn’t guaranteed. He didn’t do a whole lot to impress in limited action. 2011 Depth Chart: Everything seems to be set except for the last spot, unless Riley Cooper makes big enough strides in year two to challenge the elder statesman Avant (who’s only 27 years old) for playing time. 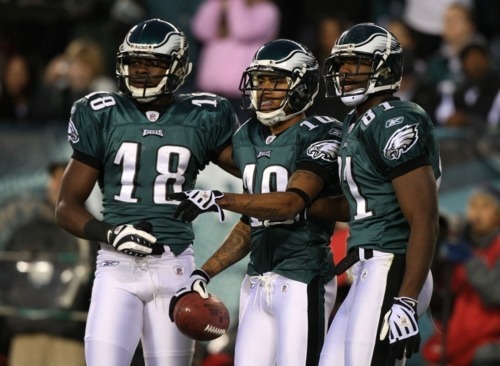 I expect the Eagles will draft another late round wide receiver to compete with Hall and the practice squad fodder on the roster like Sinorice Moss, Rod Harper, and Jeremy Williams. Potential Additions: If the Eagles are going to dress a fifth wideout, the player is going to have to offer something else. That something extra is probably on special teams, where the Eagles are still looking for a reliable kick returner. Look for someone like that in a late round. I’m certainly no draft expert, but reading some of the scouting reports guys like Ronald Johnson from USC, Dwayne Harris from East Carolina, or Jeremy Kerley from TCU could fit. Future Outlook: Future is brighter here than perhaps anywhere else on the team, assuming the Eagles can lock up DeSean Jackson to a long term deal. Once all this lockout nonsense is behind us, that should happen fairly quickly and the reign of explosive young wide receivers will continue. Tagged with Philadelphia Eagles, NFL, Offseason, Wide Receiver, DeSean Jackson, Jeremy Maclin, Jason Avant, Riley Cooper, Chad Hall, NFL Draft, 2011, Special Teams, Kick Returns, Future, passing, Offense. April 8, 2011 by Brian Solomon.